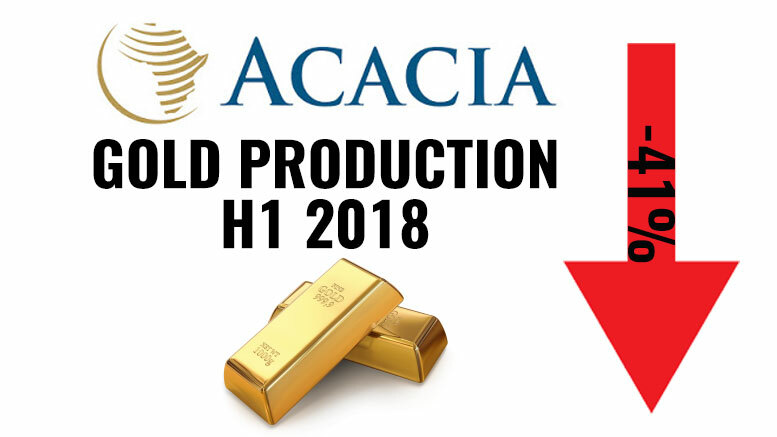 Acacia Mining (LSE: ACA, DSE: ACA), Tanzania’s largest gold miner, has recently published its unaudited results for the six months ended 30 June 2018, indicating a gold production of 254,759 ounces, 41% lower than H1 2017. However, despite the continuation of the challenging operating environment and the on-going disputes with the Government of Tanzania, the group has delivered a strong operational performance in H1 2018. “In achieving first half production of 254,759 ounces we are on track to achieve the top end of our guidance range of 435,000-475,000 ounces for 2018 and continue to demonstrate the resilience that we have built within our business. All gold produced in 2018 is expected to be in doré form and will not, therefore, be impacted by the current GoT export ban on concentrate,”, the company’s press release report reads. Acacia is currently on a raw with the Tanzanian government after a presidential committee found in May 2017 that the company allegedly under-declared its exports and eventually presented it with a demand for USD 190 billion in unpaid taxes.